The blood stains on the animal’s head resulted from a deadly fight with another rhinoceros. The loser died, and this is the victor. The same keratin that rhinos have to defend and to kill their own kind, is the reason why some men want to kill them. In April of 2012, I had the good fortune of being invited to go as an observer on a rhinoceros relocation operation in northern Namibia. The Ministry for Environment and Tourism has a full-time team that works on these operations throughout the year. It is a wonderful system in place because of the importance of managing the critically endangered rhino populations as well as counter the ever-present threat of poaching. The details of rhino populations, locations, DNA samples and the fancy gadgets they tag them with are all strictly confidential information. 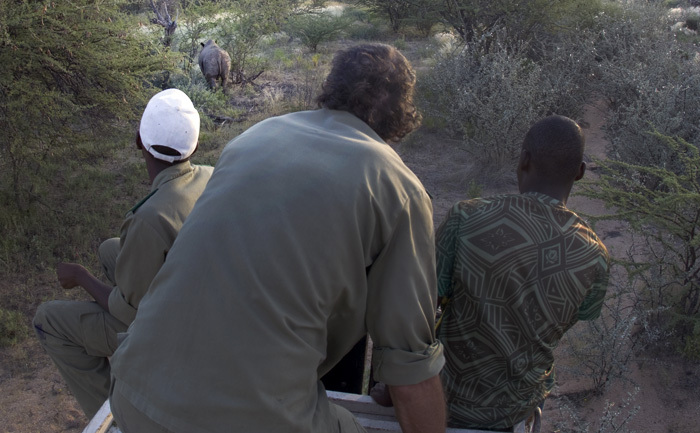 However, it is heartening to see the importance they place on every single rhino’s life in Namibia. 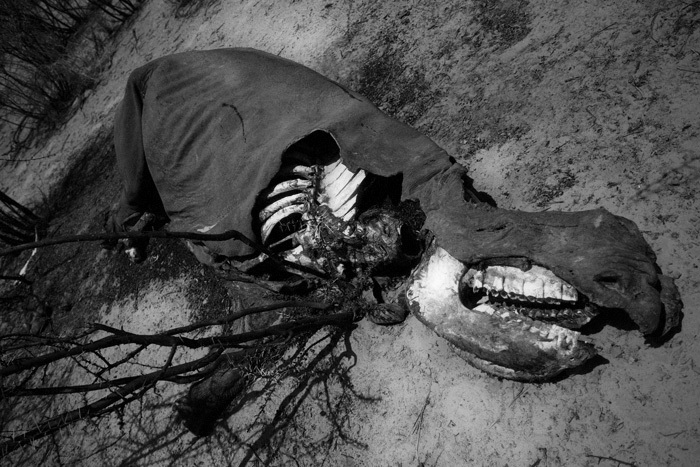 A dead rhinoceros with its horns removed. Capturing rhinoceroses, tagging them and safely transporting them is no easy task and I was amazed at the intensity of the work involved. Before the crack of dawn, the team is busy checking, preparing and organizing vehicles, medicine, oxygen tanks, dart guns and countless other kinds of contraptions. Everyone has a specific role as if it is an assembly line. Black rhinoceroses prefer to be in vegetated habitats and the bush can be notoriously thick in places where rhinos seek to practice their solitary nature. Often, there are ground teams tracking targeted rhinos for several days, as driving around to find them will be futile and even impossible. Helicopters and fixed wing planes arrive at the scene. The chief of operations briefs the team, and the best spotters board the plane and the helicopter. The helicopter will also carry a veterinarian who will be in charge of darting any targeted rhinoceroses, and after that ensuring the safety of the rhino as well as the capture crew. The plane will spot a rhino and radio in the helicopter, if the helicopter doesn’t find one first. The ground crew are required to be within a few kilometers of the helicopter at all times. The helicopter twists, turns and swerves wildly, and then descends to just above the bushes. Rhino down! 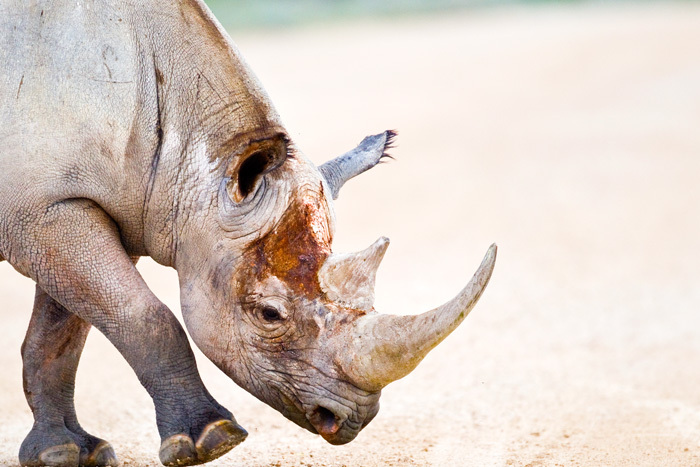 The veterinarian and a warden jump off the chopper and run to the rhino with chemical concoctions and oxygen tanks, they must keep the rhino alive and well. It is also a very dangerous mission because there could be other rhinos in the vicinity or the darted rhino may not be fully incapacitated. The helicopter takes off and guides the ground team to the spot. The scene at the downed rhino bears a resemblance to an operation theater – the vet’s medicines and tools are perfectly labeled and laid out, and has a strict no-entry perimeter of several feet around it — a protocol that cannot be broken. The supplies truck takes position, and the person in-charge of that needs to hand out tools and papers when required. There are no instructions being broadcast, everyone knows what they are doing. 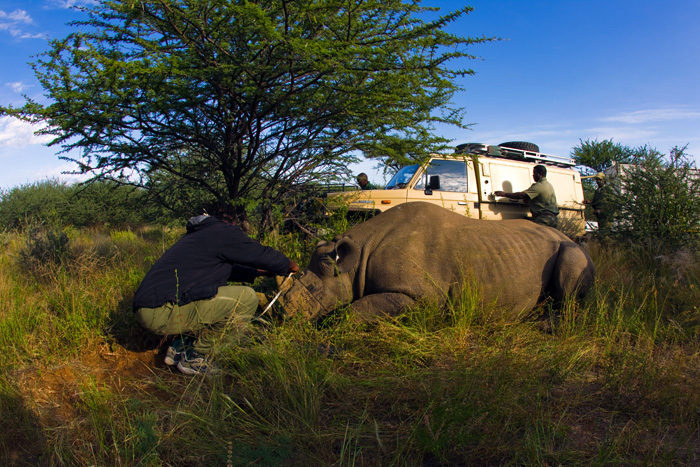 Teams begin to put collars, take samples, tag and put in cutting-edge electronic gadgets into the rhino. The rhino is finally ready to be relocated. A large container arrives. The animal is blindfolded, and a rope tied around its horns. It must be pulled into the container while it is in a semi-drowsy state, that’s the only safe way. Half a dozen strong men line up to play tug-o-war with the pachyderm. Three or four seasoned, and hardy, men take their position behind the rhino to push it in the direction of the pull. 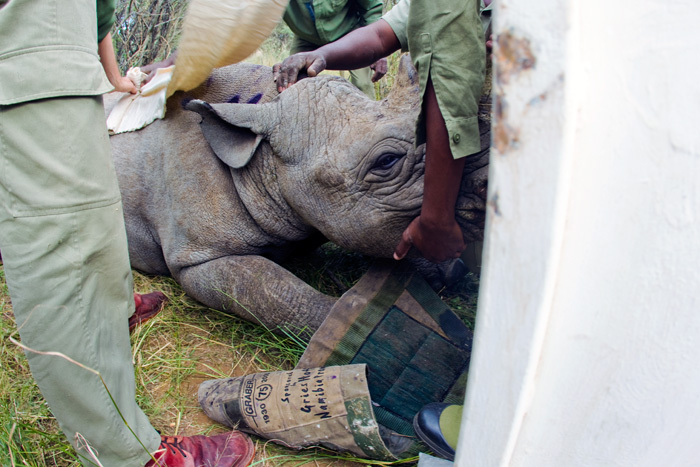 The vet takes pumps in a syringe of chemicals that wakes up the rhino. Too much antidote can make the rhino invincible, and too little would be useless. It’s a tough job. The musclemen are ready. We pull, and push! Even a half-strength rhino is an incredibly strong opponent for half a dozen fully grown men. The rhino is in the container, and the doors are quickly sealed. The vet has to carefully remove the ropes and prepare for a long journey that follows. 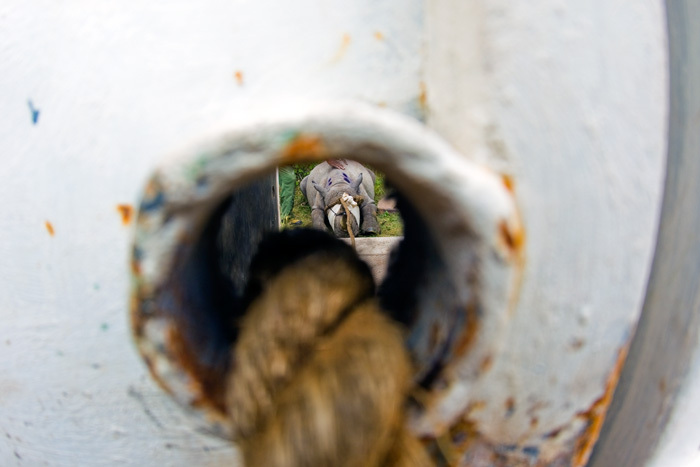 He has to travel with the rhino to its end destination, and has to be continuously monitoring the condition of the stressed animal along the way. Half the ground team can now rest, while the other half has to go help with the release process. After several hours of travel on rough roads, we finally get to a remote destination that had been predetermined to be the new home for the captured rhino. The truck unloads the container and moves away. There is only space for four people to sit precariously on the container as the animal is freed from its blindfold and the doors are opened. There are no guns, or other contraptions to help us should the rhino decide to attack the container in anger. However, animals are far more forgiving than men, and the rhino quietly moves away into the bush. I feel blessed. A full fifteen hours after the day began, we’re back at base camp. It is now very dark and my tent in the bush had been uprooted by the wild winds. My flimsy American backpacking tent is no good in Namibia, it seems. I work hard to put it back up into a respectable position. With food in the belly, sleep will come quickly after a hard day’s work… uhm… watching a hard day’s work. The wind picks up again and starts rattling my tent, and a hyena laughs not too far from camp. It was just another perfect ending to another wonderful day in the Namibian bush. The team preparing the rhinoceros for the move. 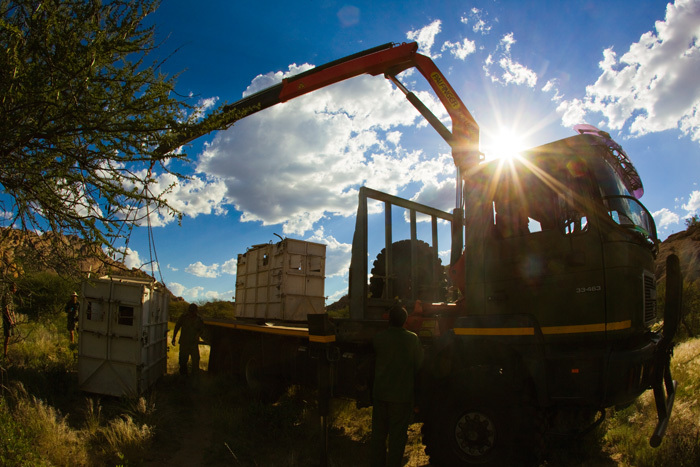 A rhinoceros container is being unloaded to release a captured rhinoceros in its new home.